Jayvee Casio went on a rampage as he scorched one of Malaysia's professional basketball teams, the WKL Malaysia Dragons. Gilas won the game with the score of 95 to 64. They've just established a flawless, 2 wins and 0 loss record in the 2011 FIBA Asia Champions Cup in Pasig. The WKL Dragons showed their defensive prowess in the first quarter. They pressured the guards of Gilas and it resulted to 11 turnovers. WKL exposed Gilas' luck luster attitude. Gilas is like diesel. They don't put in the work early but they get serious when the crunch time comes. That's not a stuff of a great teams. They should always play hard every time they step on the hard wood and that's also a way of showing respect to your opponent. By the end of the first half, WKL's hard work paid off because they were able to lead by 1 point, 40 to 39. Smart Gilas experienced a shell shock in this game. They didn't expect WKL to play like they did a while ago. They took them lightly. 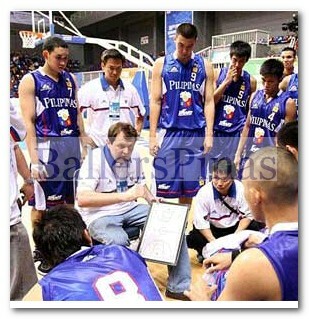 Coach Rajko was forced to insert the old veteran Asi Taulava in the 3rd quarter. He was able to make his presence felt by the big men of WKL. He banged the body of WKL's taller center, Christopher Martin Ayer. His physical presence along made a big difference in this game. Taulava only had 2 points but he was able to use his veteran smarts that helped Gilas win this game. Jayvee Casio and Chris Tiu were the ones who made the big shots for Gilas in the second half. They handled the scoring chores today. This is a good sign because Gilas' players are slowly learning to step up when their comrade is not doing good. Tiu and Casio knew that Aguilar probably got tired because of his big game last time. The two ace guards, Tiu and Casio combined for 21 big points for Gilas. They were the reason for the 50 percent field goal shooting of Gilas. Japhet did not have a great scoring game but with the use of his 7'1 wing span he was able to block 3 shots that came from WKL. Also, Taulava and Douthit combined for 26 rebounds. These three players did great in terms of defending the bigs of WKL. Here's the complete stats of this game. As you can see there were 6 Smart Gilas players who had a double-double game. That's again a good sign for Gilas.